ZIMPOL/SPHERE PDI observations of HD 169142 in VBB. Credit: Bertrang et al., 2017. (Phys.org)—A new study based on observations conducted via the Zurich imaging polarimeter (ZIMPOL) reveals insights into the nature of a protoplanetary disc surrounding the star HD 169142. The research, presented in a paper published November 24 on arXiv.org, uncovers sub-structures and offsets in the dust distribution of the inner part of the disc. Located some 380 light years away from the Earth, HD 169142 is a young (about six million years old) Herbig Ae/Be star approximately two times more massive than our sun. The star is known to be orbited by at least one massive gas giant planet and has a protoplanetary disc. The disk surrounding HD 169142 has been the target of numerous observations from the near-infrared to the mm-wavelength range. These observations revealed that this disk consists of thick bands of dust, separated by deep gaps. HD 169142 was found to have a cavity with a radius of about 16 AU and an annular gap present at approximately 32 to 56 AU. More recent study detected a residual disc at about 0.16 to 0.48 AU from the star, and a third, narrow gap was found this year at a distance of about 85 AU from the star. Now, a group of astronomers led by Gesa H.-M. Bertrang carried out new observations of HD 169142 with the aim of learning more details about the structure and properties of its disk. For their studies, they employed the ZIMPOL polarimeter, which is a subsystem of the Spectro-Polarimetric High-contrast Exoplanet REsearch instrument (SPHERE) at the Very Large Telescope (VLT) in Chile. ZIMPOL allowed the team to probe the disc as close as 3.5 AU to the star and to trace the disc out to approximately 126 AU. These observations generally confirmed previous results and revealed indications for planet-disc interactions, such as small-scale structures, star-disk offsets, and potentially moving shadows. "In this work, we present our new SPHERE/ZIMPOL data on HD 169142, which confirm the previously found gap structure and reveal yet undetected indications for planet-disc interactions in the form of sub-structures and offsets in the dust distribution of the inner part of the disc," the paper reads. The research confirms that the disc surrounding HD 169142 is flat, self-shadowed and is interacting with the star. In particular, the study revealed complex, irregular sub-structure of the disk's inner ring and its offset position relative to the star. This ring also exhibits a surface brightness dip. The researchers suggest that these results could be explained by three giant planets, located at 15, 35 and 45 AU from the star, which could form the bright inner ring with its sub-structures as well as the surrounding gap. The study also found that the gap separating the bright inner ring from the outer disc is not annular, as previous observations suggest, but of elliptical shape. According to the authors of the paper, this could be due to a circular outer disc that is observed under an inclination of 13 degrees. 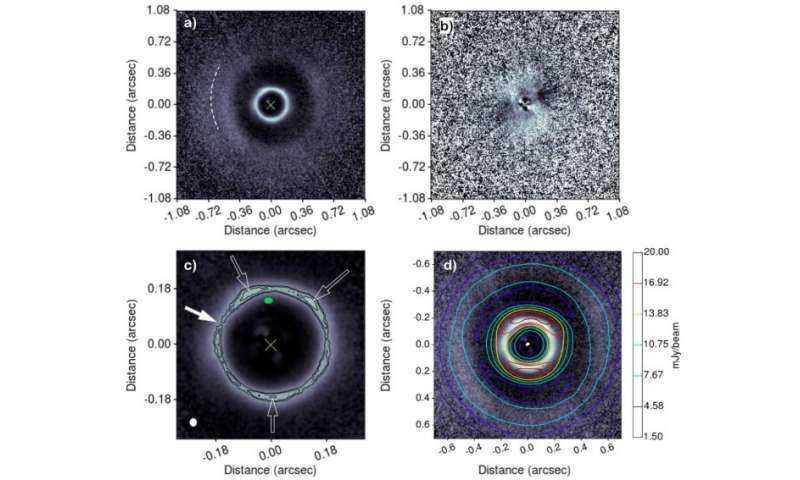 In general, observations performed by Bertrang's team shed some new light on the nature of the disk around HD 169142 and could improve our knowledge about many aspects of star and planetary formation. This is because circumstellar discs around young stars are the key to understand these formation processes. Studying disc evolution and dispersal could offer better understanding of the origin of planetary systems. We present new data of the protoplanetary disc surrounding the Herbig Ae/Be star HD 169142 obtained in the very broad-band (VBB) with the Zurich imaging polarimeter (ZIMPOL), a sub-system of the Spectro-Polarimetric High-contrast Exoplanet REsearch instrument (SPHERE) at the Very Large Telescope (VLT). Our Polarimetric Differential Imaging (PDI) observations probe the disc as close as 0.03" (3.5au) to the star and are able to trace the disc out to ~1.08" (~126au). We find an inner hole, a bright ring bearing substructures around 0.18" (21au), and an elliptically shaped gap stretching from 0.25" to 0.47" (29-55au). Outside of 0.47", the surface brightness drops off, discontinued only by a narrow annular brightness minimum at ~0.63"-0.74" (74-87au). These observations confirm features found in less-well resolved data as well as reveal yet undetected indications for planet-disc interactions, such as small-scale structures, star-disk offsets, and potentially moving shadows.